The Love Song of Miss Queenie Hennessy is a companion novel to The Unlikely Pilgrimage of Harold Fry (reviewed here). Rachel Joyce wrote Queenie’s story long after Harold Fry’s, but said that they were designed to sit together, rather than as a prequel. Queenie Hennessy could be read before Harold Fry, but I would recommend reading Harold Fry first. Queenie Hennessy is dying of cancer in St Bernadine’s Hospice, run by an order of nuns. Harold Fry believes he can save Queenie by walking to her. He lives in Kingsbridge (Devon), and Queenie is in Berwick-upon-Tweed (Northumberland). The book gives the account of Queenie, her life as a retrospective interspersed with life in the hospice as she, and her fellow patients, wait for Harold Fry. Queenie’s cancer affects her jaw, which means that she has trouble speaking. This is crucial to the plot. Queenie is on her death-bed, burdened with a secret, something she needs to reveal to Harold Fry. One of the nuns, Sister Mary Inconnue, persuades Queenie to write a letter to Harold, which becomes the love song, as she unburdens herself. 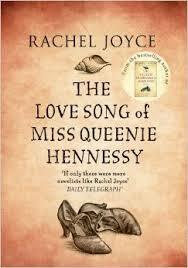 The Love Song of Miss Queenie Hennessy is a charming and gentle read. It is a quiet read, without huge drama, and yet it is moving and compelling. Queenie Hennessy herself is an intriguing character. She led a largely lonely life, content to love someone else’s husband from the wings. Joyce shows us her passions, dancing and her sea garden, but these are internally held. At one level, Joyce has created a dull and needy heroine in Queenie Hennessy, and she was not always easy to be around. The more vivid personalities were those in the hospice, those that leave one by one. I particularly loved Finty and The Pearly King. I enjoyed the scenes in the hospice more than I did the self-indulgent ‘confession’ of Queenie herself. My favourite character was Sister Mary Inconnue, the nun that sits quietly with Queenie, and encourages her to live out her last days. “You don’t need to leave the room to go on a journey.” Who doesn’t need a Sister Mary Inconnue in their life? Through this quiet book, Joyce tackles huge themes. Death, dying, loss, forgiveness, love, and, anxiety. Themes that roll around the pages of the book like movements in a symphony. Death is never far from many pages in the book, yet it is not a morbid book. I laughed and cried in reading The Love Song of Miss Queenie Hennessy, and felt bereft when I closed it for the last time.